Only 5 years old and extremely well kept one owner custom built one level home in Keowee Key. 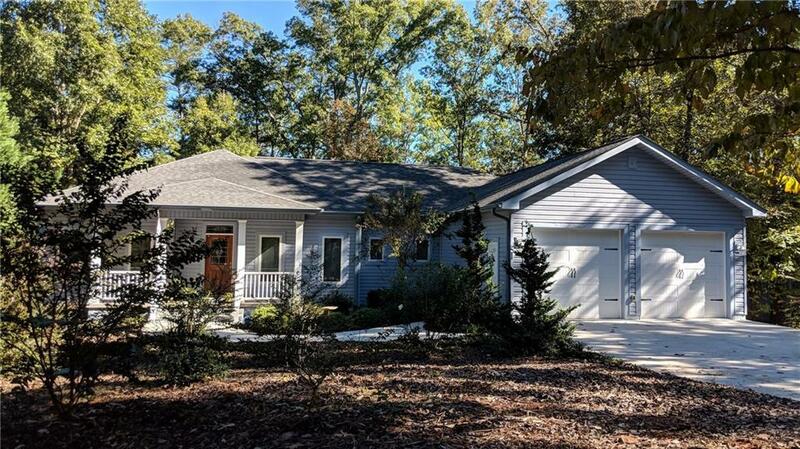 This clean ranch home is considered a bargain as so many home in Keowee Key are much older. Located close to the golf course and country club 2 Spinnaker Way has golf course views and sits on an elevated lovely wooded golf course lot with practically no maintenance. The cost to build this lovely home was much higher than the asking price. Custom features are Andersen casement windows, 2x6 framing for extra insulation (extrememly low utility bills) perma stone tiles in the kitchen, custom cabinetry throughout and many more. The livingroom is centered by a glass enclosed fireplace that keeps you toasty warm in winter with custom built shelving and cabinets on either side. The indoor all seasons room living space has numerous windows that bring in natural light and provides additional living space for family or guest but can be shut off when not in use. The exterior deck is built of trex decking material. Upon entering the home the sunny front porch with the stained leaded glass door welcomes you into a nice foyer that opens up to the dining room and living room. The main flooring in the home are rich warm engineered hardwoods. The kitchen has lots of cabinet space with solid surface silestone, a range with retractable lit hood and custom cabinetry that include soft close drawers. The accent glass cabinet can be used as a china cabinet or curio for those special items. The master bedroom is extra large and comfy with custom walk in closets and the master bath includes an oversized walk in shower and separate tub. The vanities are his and hers and there is a lot of custom lighting. The marble shower has ADA grab bars and seats. Check out the laundry room that includes a half bath, laundry sink, lots of shelving, a fold table, built in ironing board plus the washer and dryer! The garage is finished with drywall and additional shelving plus a great storage room and is insulated. The carriage styled double garage doors are also insulated. Very energy efficient. The power bill for August of 2018 was $65.50! The owners moved in March of 2013, very new.There is a large walk in crawl space for storage under the house. A very private setting with lots of deer family visiting the back yard woods that adjoin the golf course. Keowee Key has the lifestyle for active retiree adults. A great golf club, country club, 3 pools, two marinas, top notch fitness center, tennis, pickleball, bocce ball, lots of walking trails, dog park, boating access, kayak and canoe launches and much much more. A lovely well ran community Keowee Key is rated as one of the top retirement gated communities as homeowners fees are under $5000 a year.